These Giant Lemon Mousse Sugar Cookie Cups are almost too pretty to eat with rich, fresh, yellow lemon mousse filling inside a delicious jumbo sugar cookie cup. Great, easy spring dessert recipe and perfect recipe for Easter! Welcome to giant sugar cookie cups recipe #2! I announced last week that I’m excited to have a new thing on Wishes and Dishes where I share different versions of jumbo cookie cups made in a JUMBO muffin tin (you can buy one here for really cheap! I linked to the exact one I have). My first idea was Carrot Cake Cookie Cups that I shared last week. 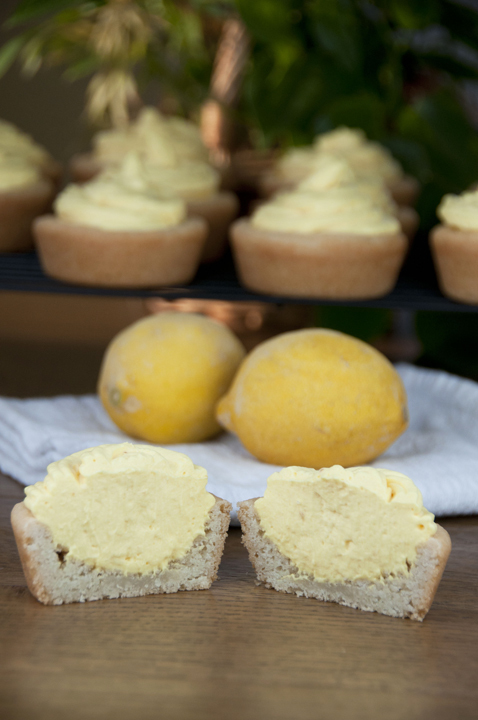 These new giant lemon mousse sugar cookie cups are the size of cupcakes – they even look like cupcakes at first glance and are meant to serve as individual desserts for people. They would be great for Easter coming up or a night that you have dinner guests! 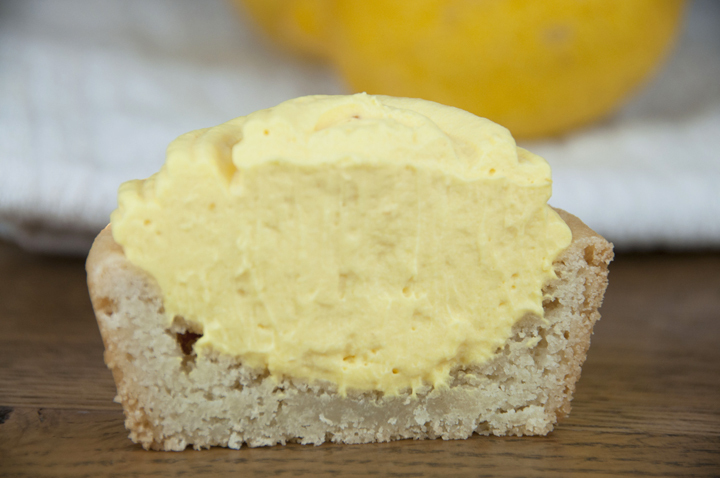 They are a really fun alternative to a slice of cake or pie and you will absolutely LOVE the lemon mousse. You will probably even have some leftover to eat all by itself! 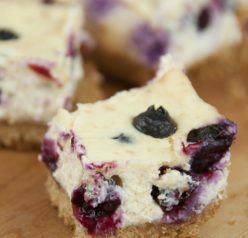 You should also try my Lemon Blueberry Cheesecake Bars. I love lemon desserts all year ’round, I have to admit. Lemon desserts aren’t just for spring and summer anymore! Sugar cookie cups just looks fancy when you bring them somewhere for dessert. I’m not sure what it is about cookie cups, but they put smiles on peoples’ faces. You will also love my lemon chip macadamia nut cookies. 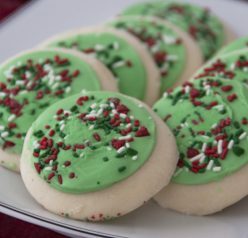 These particular cookies are thin and crispy versus soft and chewy. I always like to know the texture of a cookie before I make it so I know what to expect. I’m also loving these Lemon Meltaways. Note: You can get a jumbo muffin tin on Amazon if you don’t already have one. They are also great for making bakery style muffins, etc.! I also use these reusable Wilton cupcake decorating bag and decorating tips for piping on the frosting. Giant Lemon Mousse Sugar Cookie Cups with rich, fresh lemon mousse filling inside a jumbo sugar cookie cup. Easy spring dessert recipe - perfect for Easter! 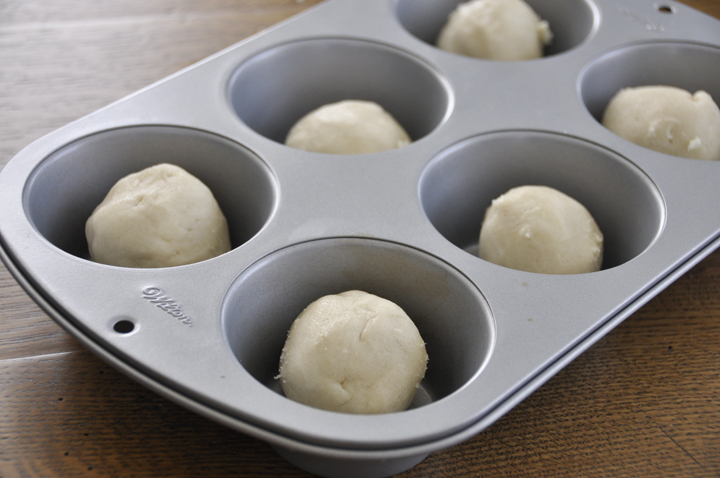 Spray jumbo muffin tin(s) with nonstick cooking spray. Break off chunks of dough and roll into balls (picture above shows how big to make them). Drop balls into muffin tin. Bake 20 minutes, or until puffed and set, and golden around the edges. They might look a little undercooked at the bottom but they will harden as they cool. As soon as you take them out of the oven, use something with a circular bottom (I used the bottom of an ice cream scoop) to press into the middle of the cups and make craters. Whatever you use should be slightly less than the width of the cookie. Let cool completely IN the pan. In a large bowl, beat the cream and vanilla on high with a hand mixer until stiff peaks form. Place in fridge. In another large bowl, whisk together pudding mix, sweetened condensed milk, water, and lemon zest until thickened, about 2 minutes. Place in fridge for 5 minutes to set up completely. It should be thick. Fold whipped cream into pudding just until evenly distributed. Stir in yellow food dye (I used quite a bit to get the rich yellow color I wanted). Cover and place in fridge. Run a butter knife around the edges of the cooled cookies to loosen and gently lift out. I didn't need to do this, I just pulled them out with my fingers. Transfer to whatever surface you wish to work on. Transfer lemon mousse to a piping bag, or make your own piping bag using a ziplock bag (put filling in piping bag, work it to the bottom of one corner, twist off the top and snip off a small bit of the corner). Pipe the filling in high, swirling mounds. You can also just scoop the filling in with a spoon but it won't look as nice, in my opinion. Store in refrigerator in an airtight container after assembled or until ready to eat. 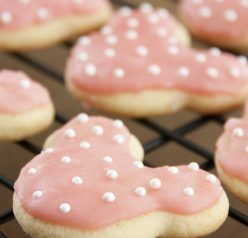 These look yummy and beautiful!Thanks for sharing. Thanks so much for commenting, Kelly! Love these jumbo cookie cups. The lemon mousse looks so good! Why thank you!! It IS really good!! The recipe sounds delicious and I may try using individual ramekins because maybe I am just hopelessly old and frugal but i do not consider $16.49 to be cheap for a 6 cup tin. Oh no I totally understand! It’s weekend because the price fluctuates on amazon and it has gone up wince I bought it! It’s worth it for me I guess (the 14$) or whatever I paid because I use it a lot. Ramekins is a great idea! Ooo I’ve never had lemon mousse but it’s gotta be wonderful. Yum! These look so delicious. I definitely want to try them. Thanks for sharing! Oh the torture! I want to sink my teeth into that lemon mousse…. Mmmmm! You aren’t kidding when you say ‘giant’! What a great idea. So creative! Perfect timing for Easter as you suggest. These are gonna knock a lot of people’s socks off on Easter!!! Wow! Those look beautiful! I just love cookie cups and that mousse looks divine! I love cookie cups and these look to die for! Oh my goodness but those look divine! 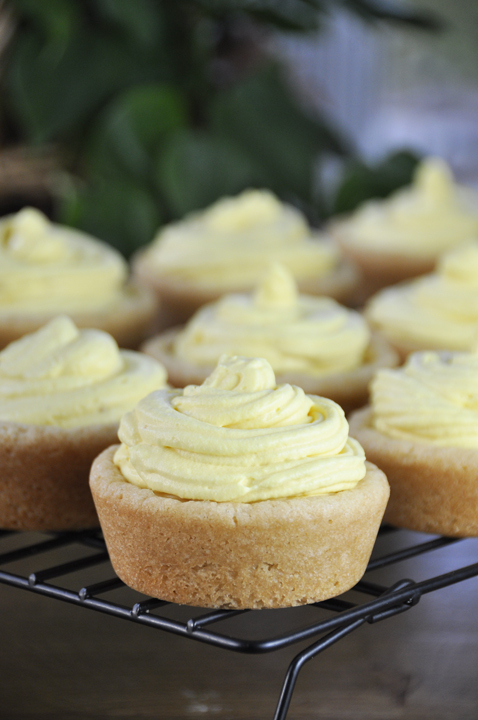 I love lemony desserts and these cookie cups look perfect! I love me some lemon! So this speaks to me. And giant? Even better! Oh sweet mamma I need about a dozen of these right now! Look at all that pretty mousse! I love the color – just perfect for Easter! Woah! These look fabulous! I love lemon cream – what a great idea!! These look so yummy! I love lemon anything!! YUM! What a perfect spring treat!!! Anything lemon! I’ll take all 12, please. 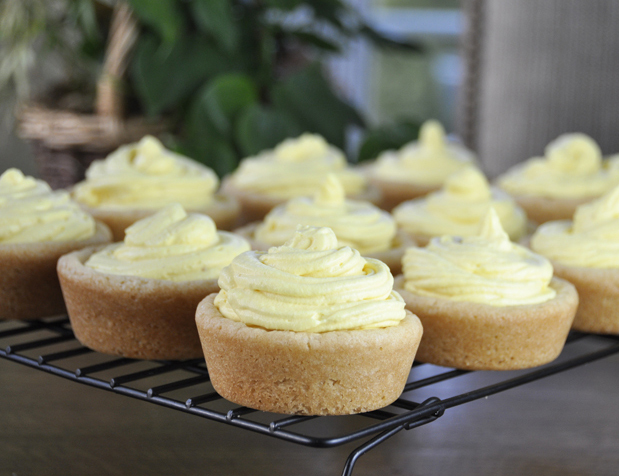 I love cookie cups, and these lemony ones look so delicious! GIANT cookies?! Oh heck yes! As a girl who loves the look of cupcakes but the taste of cookies, this is just my style! This is just wrong, in a good way! Giant cookie cups? Oh yeah! I love mousse but have never had it lemon form. I need to change this right away! WOW! These look amazing!! Love how you put the mouse in there!! YUM yum yum!! Love that these are seriously loaded down with the lemon mousse. I bet it’s just like frosting – the more the better! Ooh – lemon mousse cookies are perfect for spring! These are so cute – love the Easter colours! What a great idea! I bought that exact pan a couple of months ago, and have been looking for something besides muffins to bake in it. LOVE these! I think these are going to take off! The perfect dessert! I love everything about these adorable bites – and am a huge fan of anything lemon. Pinning and sharing!